This evening I was in the mood for pizza. Usually I make my grain free pizza crust for myself and a separate regular wheat crust for hubby (he is not wheat/grain free). Tonight I decided there was no reason to continue making two different kinds of crusts unless he really did not like my crust after trying it. We both prefer different toppings so I made a double batch of my Almond Flax Pizza Crust that made a larger cookie sheet sized pizza with "his and hers" halves. 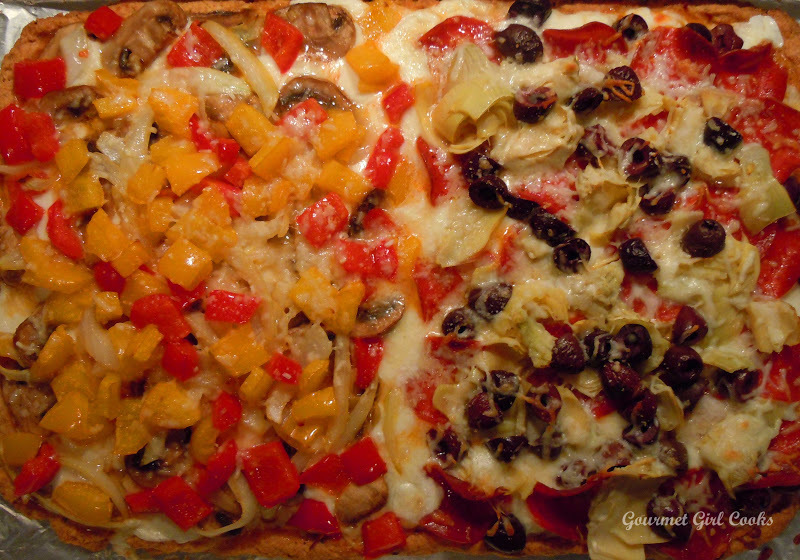 He had his Kalamata olives, artichokes and turkey pepperoni on his half and I had mushrooms, onions and red and yellow peppers on mine. It turned out great...but the best part of all is he looked at me and said "this is really good" -- and he picked it up and ate it just like he usually does his regular wheat riddled crust. So, effective immediately, I don't have to make 2 different kinds of crusts every time we have pizza now! He asked how long it took to make the crust and I told him about 5 minutes to mix the ingredients in a bowl and another few minutes to spread it out in the pan with a rubber spatula before baking it. Most of the cooking is done before putting the toppings on and during the 20 minutes or so it takes to bake the crust, I precook any raw toppings since it only goes back into the oven for 5 to 10 minutes after you place the toppings on top. 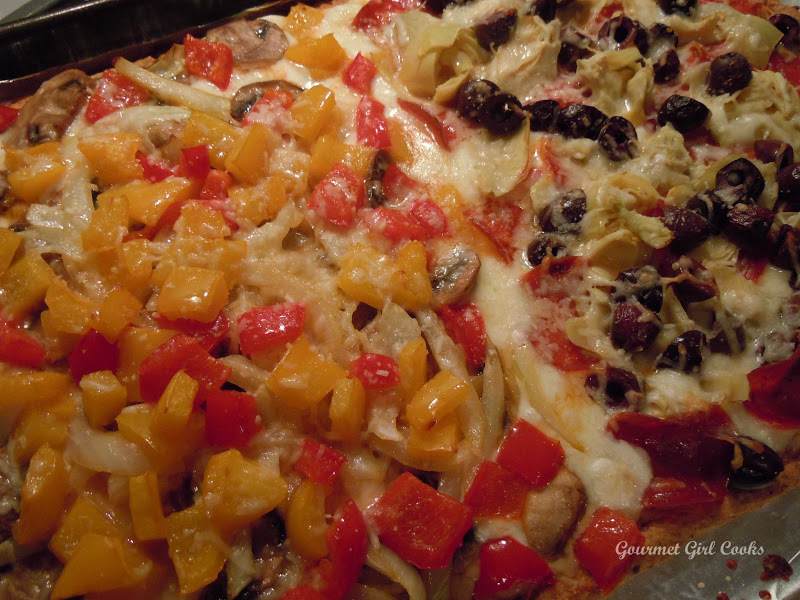 While I have made a cauliflower crust before (and posted it)...it was so tedious to make and you definitely needed a fork and knife -- there was NO picking that pizza up (not in my lifetime, anyway). I also have made an herbed flax Parmesan crust that I like a lot too...but when one of my readers asked me to make a crust that wasn't all flax, I tried out a combination of almond flour, golden flax meal, Parmesan cheese and herbs and spices and created my "Almond/Flax/Parmesan Herb Pizza Crust". It has turned out to be my "new favorite" pizza crust! Now that I know hubby likes it too, this will definitely become my go to crust for both of us. I am going to include the recipe for the larger pizza crust below (which is essentially a double batch of the recipe that normally makes a thin crust 10" round pizza). This doubled crust recipe will make a thin crust cookie sheet sized rectangular pizza. The trick to handling this crust easily is that I use non-stick foil sprayed well with olive oil and then I plop the dough ball in the center of the pan and using a rubber spatula (also sprayed with olive oil), I begin pressing it out from the center towards the edges until it is uniform thickness and the shape that I want it. Your dough will be a bit sticky, but it should be sort of firm, not wet and mushy. If you need to thicken it a bit more, add a little more finely grated Parmesan cheese until the dough can be pressed out nicely into the pan. I reduced the amount of water by a few teaspoons when I doubled this recipe. 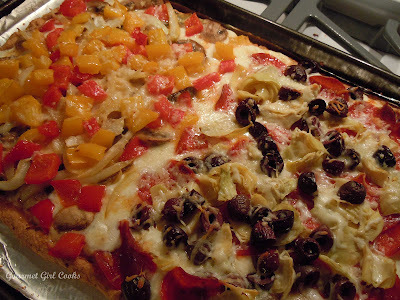 Below are a few pictures as well as the recipe for the larger pizza crust (you could also make 2 separate 10" round pizza crusts instead of the larger crust if you preferred). Enjoy! Preheat oven to 375 degrees. In a medium bowl, mix dry ingredients together; add wet ingredients and mix well. Let the dough sit for about 5 minutes to thicken. Spread dough on a lightly oiled large rectangular cookie sheet (or pizza pan) on greased parchment paper (I use Reynolds non-stick foil, lightly brushed or sprayed with olive oil. Place ball of dough in the center of the pan and begin pressing the dough outward with a lightly oiled rubber spatula (so it doesn't stick). Bake for about 20 minutes or until cooked through and dry/lightly crisp feeling to the touch (check the crust after 15 minutes and take out if it looks and feels done). Add sauce, cheese, pre-cooked toppings and place back into the oven for 5-10 minutes to melt the cheese. If desired, run under the broiler for a few minutes to lightly brown the toppings and make the cheese bubbly (be careful not to burn it). ***Note: The amount of water in the recipe above has been reduced when I doubled the original recipe (I found that it worked better for spreading the dough over a larger surface area). I'm curious what your thoughts are on using a pizza stone for thi? I like the idea of trying this with a pizza stone. Perhaps rolling the dough between two pieces of greased parchment paper and putting that on the pre-heated stone to bake would give a good result and still protect the stone? Vivian -- that just might work! Either way, I would not spread this dough directly on my pizza stone until I did a small "test sample" first -- otherwise you could end up with a big mess on your hands! The parchment paper might just work though! Let me know if you try it. I would love to be able to use my pizza stone -- when I used to make regular pizza dough -- I always dusted my stone with cornmeal to keep it from sticking...I can't do that though with all the carbs in it. My husband and I cooked your cauliflower crust pizza last night. We give you HUGH thumbs up. I used a pizza stone for this, but I kept the dough on the parchment paper on the pizza stone during the 20 minute pre-cook. After that 20 minutes, I slid the dough off the parchment paper, directly on to the pizza stone, added my toppings, and finished the 5-10 minute back from there. It worked GREAT! I cooked this in the oven. I made it for myself so I cut all ingreds. in half. Made a spinach pizza. In a 10 inch round. It came out Soo good. Of course the 1st time is always tricky. I think I didn't spread it enough so it came out as a thicker crust. I would add more vegs next time...which is tomorrow. Now I have a pound of mozzarella cheese and a big bag of spinach. So maybe.... pizza week? Thank you! Thank you! Thank you! This was the best thing ever!Absolutely loved it! i tried this on a greased cookie sheet and was shocked at how edible it turned out! it was surprisingly good. so much better than the egg-based crust. This creates a real pizza - slices you can pick up....instead of a "pizza casserole" that you scoop up with a spoon. Second is to cook it a bit longer. The parts that were thin and "crunchy" were really good. I might make this again...cook it longer and break it up into "crackers"
Anyhow, we actually liked this crust as much as a typical wheat-based crust.